Rolled out of the house at 6:30 to meet Jim and BJ in Rosanna @ 7:30. The temperature was low with the chance of rain, I ached in my lats, babs and quads.... and we were planning a day in the hills. ACE! Early on the two boys were dropping me with ease, anything over 0.0001% gradient highlighted how smashed my legs were, by the time we reached St Andrews I was starting to feel better. 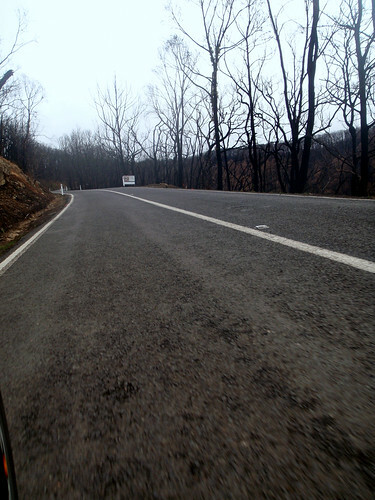 The ride up the Kinglake climb was tempered by the guys seeing the extent of the fire damage for the first time, by the time we hit the cutting I was starting to feel almost normal. With a light mist/drizzle in the air I decided to stretch out the gear I was in and to my surprise the other two dropped off my wheel.... they were probably just taking it easy. A apple/berry scroll and a hot chocolate later it was time to roll home. After Jim and BJ turned to go home via Warrandyte I slipped in a few extra hills through Eltham, Rosanna and my favourite... Burgundy St *shudder*. Post ride I was feeling even stiffer, so welcome to stretchtown population Neil.